Packed with good-for-you whole grains and fruit, these Oatmeal Blueberry Breakfast Cakes are a great way to start your day! 1. Combine oats and milk in a large bowl. Cover and let soak in the refrigerator until much of the liquid is absorbed (at least 8 hours and up to 12 hours). 1. Preheat oven to 375°F. 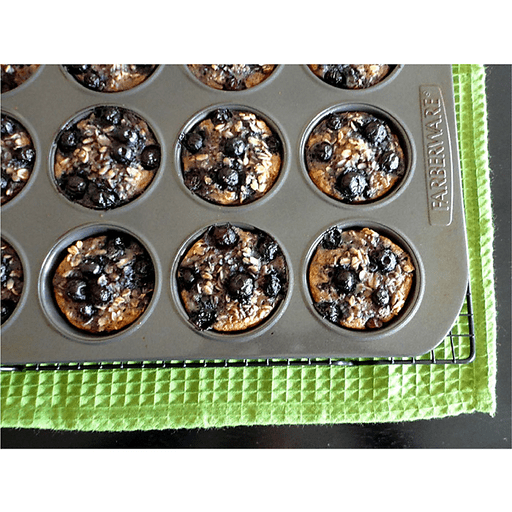 Coat a 12-cup nonstick muffin tin with cooking spray. 1. Stir egg, maple syrup, oil, vanilla, cinnamon, baking powder and salt into the soaked oats until well combined. Divide the mixture among the muffin cups (about ¼ cup each). Top each with 1 tablespoon blueberries. 1. Bake the oatmeal cakes until they spring back when touched, 25 to 30 minutes. Let cool in the pan for about 10 minutes. Loosen and remove with a paring knife. Serve warm. For dairy free: Use a dairy free milk alternative instead of skim milk. For gluten free: Use gluten free oats in place of old fashioned rolled oats. Calories 130, Total Fat 4g(Saturated 0.5g, Trans 0g), Cholesterol 15mg, Sodium 110mg, Total Carbohydrate 20g (Dietary Fiber 2g, Sugars 9g), Protein 4g, Vitamin A 2%, Vitamin C 0%, Calcium 8%, Iron 6% *Nutritional values are an approximation. Actual nutritional values may vary due to preparation techniques, variations related to suppliers, regional and seasonal differences, or rounding.